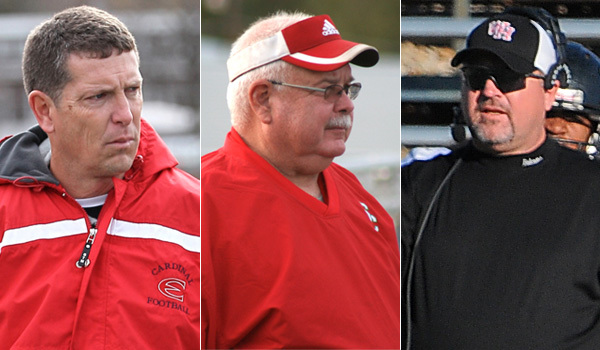 Simply put, Darren Sasse is replacing a high school football coaching legend. The former Smith Center assistant coach will take over head coaching duties for Roger Barta, who retired after leading the Redmen to 323 wins and eight state championships in 34 seasons. However, Sasse said he doesn’t feel overwhelmed by the pressure. Sasse played for Barta at Smith Center from 1987-91, and then went to be an offensive lineman at Bethany College. His duties at Smith Center consisted mostly as being the junior high head coach, but he also was involved with the high school program. “I’ve been the junior high coach, but we run camp the same week as the high school,” Sasse said. While Barta and longtime assistant Dennis Hutchinson retired, assistants Brock Hutchinson and Mike Rogers remain in place. Sasse said having a quality staff and an established program will make his job easier. “It’s not something where I have to invent anything,” he said. Smith Center also returns a veteran group of players with 14 seniors. The Redmen return eight starters on offense and seven on defense to a team that finished 6-4 and advanced to the Class 2-1A playoffs last season. Sasse will do his best to replicate Barta’s winning formula, but there may be some minor adjustments year to year. The Redmen may run the wishbone out of the pistol formation in some situations this year. Buhler takes over the Junior Blues football program after directing Class 3A Rossville to a 120-54 record over 15 seasons. He replaces Derick Hammes, who resigned. Buhler led Rossville to an 11-2 record and a trip to the 3A state semifinals last year. The Bulldogs’ only two losses came to 3A state runner-up Silver Lake. Consistently one of the best 3A programs in the east, Rossville had difficulty getting over the hurdle of rival Silver Lake during Buhler’s tenure. Washburn Rural finished 4-5 in 2012. Ironically, Hammes replaces Buhler at Rossville. Slade, who directed Rose Hill to a Class 4A state championship in 2011, leaves the Rockets to become head coach for the 6A Colts program. Slade certainly has a job ahead of him as Campus has won only eight games over the past six seasons and was 6-31 in four years under the leadership of Mike Schartz. The Colts were 1-8 in 2012. But Slade has been through this before. Rose Hill won only one game in his first two seasons, but he helped transform the Rockets into one of the state’s better 4A programs. Former assistant coach Ray Boese replaces Slade at Rose Hill. Harrison, who had been an assistant coach at Wichita Heights and Valley Center, replaces Rick Wheeler as the Falcons’ head coach. He will try to continue the success that was built under Wheeler, who will remain the school’s athletics director. Wheeler led the Falcons to three straight 6A state championship game appearances, including a state title in 2010. Wichita Heights finished 7-3 last year. Marstall, who was an assistant at Emporia for 27 years, became the Spartans’ interim head coach after Dustin Delaney left to take the head coaching job at Shawnee Mission East. Marstall is familiar with the Emporia program and its players. Starting quarterback Braxton Marstall is P.J.’s son. He inherits a strong team as Emporia finished 9-2 and advanced to the second round of the Class 5A playoffs last year. Eudora lost veteran coach Gregg Webb when he left to take over the Truman High School program in Independence, Mo. However, the Cardinals replaced Webb with another veteran coach. Kopecky was the head coach at St. Thomas Aquinas for 12 years and led the Saints to a state runner-up finish in 2008. For the past three seasons, Kopecky was the head coach at Leavenworth. He helped snap a losing streak at Leavenworth and the program showed improvement, making the playoffs in 2011 and finishing 4-5 last year. Former Olathe South coach Mark Littrell replaces Kopecky at Leavenworth after spending the past several seasons in Texas. Webb was one of the most successful coaches in Kansas history, earning 248 wins over 26 seasons with Claflin and Eudora. He won five state titles at Claflin and took Eudora to the 4A state championship game in each of the past two seasons. In Rider’s two seasons as head coach at Southeast-Cherokee High School, he helped take the Lancers from a 1-8 finish in 2011 to a 6-3 record last year. He now will try to help the Hesston program take the next step after finishing 21-11 the past three seasons. The Swathers finished 5-5 in 2012 and lost to eventual 4A state champion Holton in the first round of the playoffs. It was a tough decision for Rider as he is a 2005 graduate of Southeast High School. Jacob Lott, a former Neodesha assistant, replaces Rider at Southeast. Serving as an assistant the past eight seasons, Littrell was promoted to head coach at Louisburg after Gary Griffin turned in his resignation. The Louisburg High School graduate inherits a Wildcat program that finished 7-5 last season and won the 4A state championship in 2010. Martin left Wyandotte (Okla.) High School to take over the head coaching position at Stanton County. Martin replaces Bret Kendrick, who had a successful run as the Trojans’ head coach. Kendrick led Class 2-1A’s Stanton County to a 125-62 record over the past 20 seasons. Mark Schremmer covers high school and college sports in Kansas, Missouri and Oklahoma for The Joplin Globe newspaper.